A second window should be opened with the existing screen as an argument. After success in opening, you increase windowcounter by one. Defining an icon which will be used for your application, and drawing an image in a widget, are quite straightforward. Suppose, there is an XPM-image available, and it is the file /usr/include/pixmaps/picture.xpm. The following code sets an application icon and draws an icon in a label. RContext refers to the X-server's so-called graphics context. This specifies which line width, fill patterns, etc. will be used. That information is not contained in the XPM-file. With WMScreenRContext, we use the existing context. RLoadXPM loads the xpm from a file, and stores it as an RImage. The image is set as an icon for the application with this RImage. We transform the RImage into a WMPixmap. The WMPixmap can be shown in a widget. Here, we show it in a label with WMSetLabelImage . You must specify its position with the right option first. WINGs provide the function unsigned int WMScreenWidth (WMScreen *wmscr) to get the screen's width in pixels. There is a similar function to get its height. This is information about the virtual screen, and is not always what you are looking for. Many (or all?) Gtk+ interfaces have bigger font sizes when the virtual screen is bigger, even when the monitor is the same. If your monitor runs at 1024x768, and your virtual screen measures 1800x1440 pixels, you would often want to adjust your application to the monitor's resolution, and the view it has on the virtual screen, rather than to the screen's size itself. To get the used video mode (ie. the 1024x768 in our example), and the position on the virtual screen, the X-library libXxf86vmode provides two functions. The returned modeline is a structure which has members hdisplay and vdisplay. 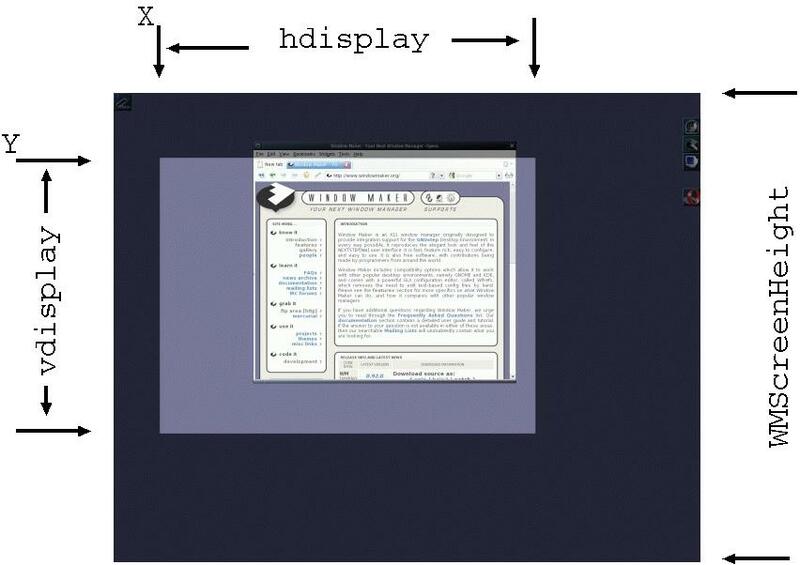 The monitor's current resolution is hdisplay x vdisplay. The monitor's left uppper corner is at the position returned by XF86VidModeGetViewPort in *x_return x *y-return. The screen parameter in these function calls is not a WMScreen variable. A WMScreen variable wmscris a structure, defined in WINGsP.h, which contains the screen number in a member wmscr.screen. The follwing example defines a function *WMGetModeViewSSize() For simplicity, it is assumed the application is using the default screen. The argument to the WMScreenWidth function should of course be a WMScreen type. meaning that the monitor is running at 1024x768, its upper left corner is at (126,171) in the virtual screen, and the whole screen has a resolution of 1800x1440. The user is seeing the screen part from (126,171) to (1150,939). In the illustration to the right, (X,Y) represent the Viewport coordinates which are obtained from XF86VidModeGetViewPort. The bright part is the part of the virtual screen which is visible on the monitor at that moment. In all the applications up till now, error and other messages have been sent to stderr or stdout. when you start the programmes by (double-)clicking in your file manager, the messages may disappear, or pop up in a window. This makes starting the application from an xterm command line the most practical. To get rid of this disappointing feature, you can programme another window to send the messages to, or, more logically, use a named pipe to send them to a different application which you already have on your system. This section gives an example how to code this last method. The method is simple: when the first message needs to be written, the code creates the pipe with mknod. If successful, it forks. The child process uses unix' execlp to start the logging application. In this example it is xconsole, with the pipe as its file argument. The parent process opens the pipe for writing. The application now can write to the pipe. The someActionWithMessage function is a WMAction in this case. Of course, there must be an xconsole in the user's path and he needs the correct rights. The example catches the events that the user clicks away the xconsole before he is finished, that the fifo file already exists, and that the fifo file is replaced with something which is not accessible during run time. There is nothing to change in main.